Our story starts with our first dog, a boxer named Wilson. We were your typical naïve, first time owners; we did an obedience class recommended to us by a friend and after 12 indoor lessons we figured we were equipped to handle our wiggly, energetic bundle of joy. Using our newly acquired dog handling skills we lived our lives for the next 10 years managing our sometimes obedient, usually not obedient boxer. I was always leery of letting him off leash, always checking who or what was around that could distract him. At some point during those 10 years I found myself on Burnaby Mountain one day and saw a gentleman (Jeff) with three dogs. He had absolute control over all three, he threw the ball & instructed one dog to fetch while the other two remained sitting where they were, to say I was amazed & impressed is a serious understatement. I saw the van with the graphics in the parking lot “Sit Happens – dog training for the real world” and it always stuck in my mind. I would from time to time see them around town and remember that day on Burnaby Mountain and what I had witnessed. Amazing. My single biggest regret is that we chose to do nothing to improve our handling skills while we still had Wilson; we were of the mind set that you ‘can’t teach an old dog new tricks’. Life went on and late 2008 we helped our be-loved Wilson to the Rainbow Bridge. 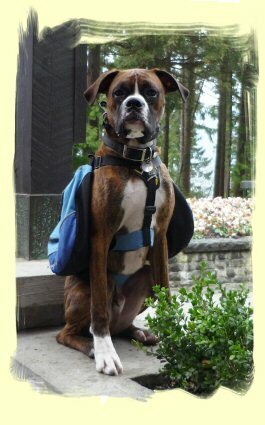 In the summer of 2009 we came across an opportunity that we could not pass up, another boxer!? We must be crazy; I had wanted a break from the responsibility of dog ownership but we could not let this one get away. Soon we had another bouncy boxer baby – 8 week old Cezar. I was determined not to repeat our last experience and let this dog live a life with ill-equipped handlers/owners, there surely had to be a better way. We were going to do this the right way from the start and began researching and reading everything; we were going to have the best dog on the block! Two weeks later I was overwhelmed with conflicting information and various training methods, none of which I felt any confidence in. Remembering that day on Burnaby Mountain, I told my husband we can not do this on our own and really needed to contact Sit Happens; we had already let 2 weeks go by without any direction for our young pup. I called Sit Happens and explained to Jeff my information overload and not wanting to start off on the wrong foot with Cezar. Within a week we had an appointment arranged and they arrived at our house to give us the course breakdown and how everything worked. We had a demo in the front yard, in the rain; we could not believe how easily the trainer was able to recall Cezar, even when he had found a dry spot in the carport; they were able to recall him into the rain. Our biggest issue at the time was that Cezar would not stop eating the dry cat food we set out for our 2 cats. Sit Happens showed us how easy it was to deter that unwanted behavior and we were sold, we signed up right away. Our puppy classes were all at home, inside the house and in our unfenced backyard. We worked on all basic commands and crate training. Soon we worked our way up to holding a sit & then heel. If something came up & we had questions outside of our appointments I felt no hesitation to call for advice. I remember a defining moment last fall when everything sort of ‘clicked’, it all made sense. I knew exactly what I wanted Cezar to do and how to tell him, and he knew what I wanted and obeyed. We were walking down the street and he fell into a perfect heel beside me, he sat when I stopped and I thought “wow” this is GREAT! People ask us how often do we train, my answer is: when are we not training? We choose from an online schedule which classes we want to attend. All classes are outdoors, in parks and most of all, they are FUN! We have had class in the brilliant sun shine and in the pouring rain, I am proud to say that Cezar is not a ‘fair weather only’ obedient dog; he obeys equally as well, rain or shine. In addition to class our everyday lives provide ample training opportunities. From the moment we get up and let Cezar out, until night when we go to bed, rain or shine, washing the car, working in the garden, putting the garbage out, camping, coming to work, or visiting friends – it is life, it’s all training and we are constantly learning. There are not enough thanks for Sit Happens, we are well underway to becoming the handlers/owners we have always wanted to be. We have the right tools and know how to use them; we are able to give Cezar such freedom, it makes me so happy just thinking about. Sit Happens is the key to our success and I am often in awe at how much happiness, satisfaction and peace a well trained owner, and therefore dog, can bring into ones’ life. (Both ours and Cezar’s) Thank-you!